Austin Parker is on a journey to bring truth, beauty, and meaning to his life. Austin Parker is never going to see his eighteenth birthday. At the rate he’s going, he probably won’t even see the end of the year. The doctors say his chances of surviving are slim to none even with treatment, so he’s decided it’s time to let go. But before he goes, Austin wants to mend the broken fences in his life. So with the help of his best friend, Kaylee, Austin visits every person in his life who touched him in a special way. He journeys to places he’s loved and those he’s never seen. And what starts as a way to say goodbye turns into a personal journey that brings love, acceptance, and meaning to Austin’s life. I read a review on this book awhile back and knew I had to check it out. It seemed to be one of those books that punches you straight in the heart, and leaves a mark for a long time to come. And it was. It most definitely was. Although you expect the flow of events, when they happen they stun you. I remember sitting on my back porch with tears pouring down my face as I read the tragic and moving story of one Austin Parker. I love to be inspired by books, and I felt that with Never Eighteen. Watching the journey made by Austin to try and help all the broken people in his life was heart-warming, and heart-breaking. He was trying to give life to those around him, because he himself didn't have a chance to live. Each person that entered the story left their own impact, be it with their stories or their lost will to live. And each time, Austin, the boy marked for death, tried to mend the broken pieces. Not everyone let him, not everyone embraced his message, but I think that was just right. 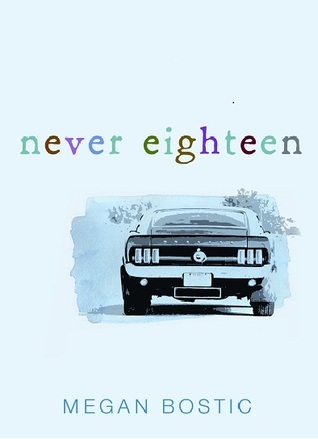 What I really liked about Never Eighteen is that it didn't focus on the illness. It wasn't a tragic story about death, but an uplifting story about the beauty of life. Austin was surrounded by death but determined to live life to the fullest, and to make sure everyone else did the same. I felt invested in the story, but I didn't know how much until I felt myself breaking down along with everyone else. I wanted this boy to get a chance to grow up, to see the world, to live a life he so greatly deserved. But, what he did in his short time was moving, and was exactly what he wanted. The only reason I couldn't give Never Eighteen five stars is because of the writing. This is a debut novel, which usually isn't a writer's strongest work. I felt the writing to be a bit too simple, and didn't wow me like I expected. The story made up for it, but the writing itself slightly detracted from my overall love. This was a tiny book but it left a huge hole in my heart. A life and death story that lifted me up, while breaking my heart. A great read, and one I won't soon forget. Smart Chicks Kick It Tour: Recap!